CitiField disappointed me so much from the start, that I thought I would give it a second chance. Only now, I have to travel a lot further to catch a game here. Hiroko and I have had a 21 game package for Angels games at Angels Stadium for the last three years and it recently dawned on me that I have been to roughly the same number of games at both Angels Stadium and Citifield. Although it has been great to watch Mike Trout play every day, it is still not the Mets. I will admit to becoming an Angels fan, but when the Mets eventually come to Anaheim, I will be wearing my Mets Jersey and battling with Hiroko all game. I brought up my affiliation to the other sports to bring in my insanity to catch a Mets game at Citifield on April 26, 2012. I spent the first half of my day on April 25th working in my Toronto office, but flew to New York in time to meet my brother Steve to catch the Clippers play the Knicks at the Garden for the final game of the NBA season. For the record, the Garden is all you need to indicate Madison Square Garden, because MSG is the only Garden that matters, regardless of what Bostonians might think. Unfortunately, the Knicks won that game and knocked the Clippers down to the 5th seed in the playoffs. The next day (April 26th), I worked a half-day in the New York office, before hopping on the train and heading out to Citifield for an afternoon game with Paul Wojtak. After that game was over, I headed back to the city to get ready for another event at the Garden. Steve and I watched the Rangers beat the Ottawa Senators in Game 7 of the first round of the NHL playoffs. I was able to see three great games in three sports in about 27 hours. In getting back to the main subject of Citifield, when it opened, there was so little within its confines to indicate that it was the home of the Mets, that it repulsed me. To the Mets credit, they actually did listen to their fans and slowly, over the last three years, brought in some Mets to the stadium, even changing the outfield wall to blue & orange. When Pa ul and I got off the 7 train at Willets Point, we headed right to the parking lot to reminisce about all the great, and not so great, times we had at Shea Stadium. The Mets did right by marking off the locations where the infield diamond of Shea Stadium once stood. 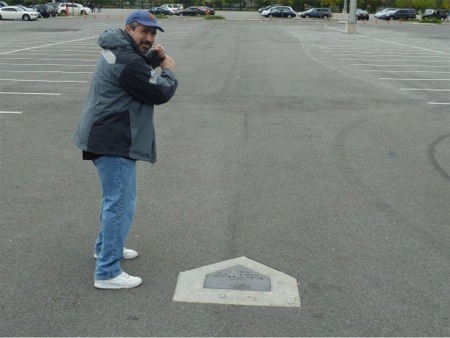 There is a plaque indicating where home plate, the pitcher’s mound and all three bases resided for the 45 seasons the Mets called Shea Stadium home. This is something I am happy about, so we of course took a few pictures as if we were either batting or standing on base. 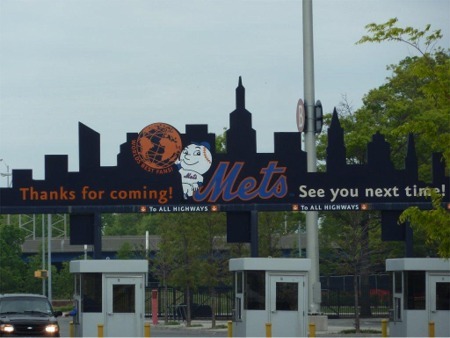 I also noticed the city skyline over the parking lot exit that is famously associated with the Mets. 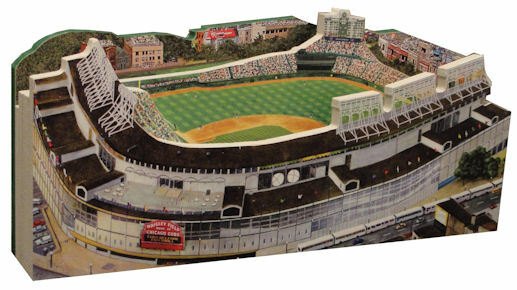 It has the Flushing Meadows Atlas with “Worlds Best Fans” and Mister Met saying, “Thanks for Coming. See you Next Time!” This has me thinking that maybe the Mets are starting to get their fans. From there we headed towards the main gate, where out in front is the old Home Run Apple from Shea as well. This is the spot that most people meet in front of to head into a game and/or take pictures, and is certainly a much better location then where it had been; it was hidden behind the stairs of the Bullpen gate. I am happy to see my former second home recognized in this way. We then headed into the stadium through the main gate and the Jackie Robinson Rotunda. I am still bothered by this tribute to a Dodger instead of the Mets, but at least now, there is a Mets Hall of Fame located in the Rotunda next to the Team Store. Although the Mets had a hall of fame at Shea by the Diamond Club, it was not easily accessible. This new Hall of Fame, which opened in 2010, is much nicer. Between 1981 and 2002, the Mets had inducted 21 players, managers, broadcasters and front office personnel to their Hall of Fame. Most of those Hall of Famers were either from the team’s inception in 1962 (Joan Payson, Casey Stengel, Ralph Kiner, and Ed Kranepool) or the championship teams of 1969 (Jerry Koosman, Cleon Jones, Gil Hodges, and Tom Seaver) and 1986 (Mookie Wilson, Gary Carter and Keith Hernandez). In 2010, with the opening of the new Hall of Fame, the Mets added my two favorite Mets; Dwight Gooden and Darryl Strawberry, plus Manager Davey Johnson, which made me much happier about Citifield. There are plaques for all of these players, plus various other memorabilia from the Mets history and the Hall of Fame includes the championship trophies and a statue of Casey Stengel. It is definitely worth a stop. Much to my pleasure, this was not the only spot that displayed giant Topps baseball cards. Over one of the concession stands behind 3rd base, contained giant cards of past players from various years including Bernard Gilkey, Ron Darling, and Todd Hundley. I made Paul circle the concourses with me, as I would typically do on my first visit to a stadium. It is good that the concourses are wide, but compared to all the other newer stadiums, these concourses give you the worst view of the field. The good thing though, is that as we walked along the concourses, we did get to see many photos of players and moments from the Mets past. Some of those photos include Tom Seaver, Yogi Berra, Gerry Grote and Casey Stengel. I actually felt that this stadium houses the Mets and not the Dodgers now. Even the concession stands bring back some Mets flavor. You can get either the Gold Glove Burger or the Mex Burger at Keith’s Grill, which is of course, in honor of Keith Hernandez, who is an integral part of Mets history as a player and an announcer. The burgers even taste good, but I had to satisfy my New York food craving with a couple slices of pizza; one Sicilian and one regular. CitiField does have the best pizza of any stadium since it is from an actual pizzeria that makes it at the stadium instead of heating up frozen cardboard like other stadiums. Once we finished our walk around the concourse, we settled into our seats on the field level behind home plate. We were able to get great seats for a fraction of the face value of the tickets via Stubhub. This is good for us, but bad for the Mets. 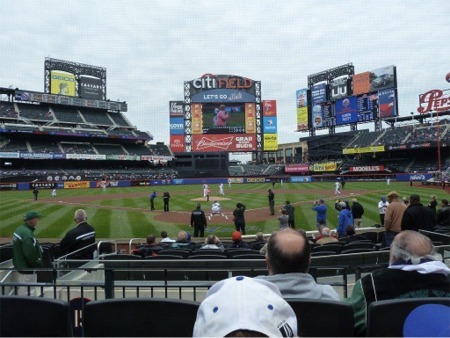 The team’s poor play and the ownership’s fiasco with Madoff and general alienation of their fans have led to minuscule attendance at CitiField. The Mets have significantly reduced their payroll by letting their free agent stars walk and not pursuing other team’s free agents. This has clearly angered Mets fans and kept them away from the ballpark in droves. Specifically, prior to the 2012 season, the Mets let their best player, and reigning National League batting champion, walk away without so much as an offer. I am talking about Jose Reyes, who is also my favorite current player. It broke my heart to see him go, but at least I would get to see him play against the Mets with the Marlins on this day. We did have a great view from our seats. We could almost call balls and strikes from them. The best part of these seats though is that it gave us a clear view of the new blue and orange outfield wall in its entirety. 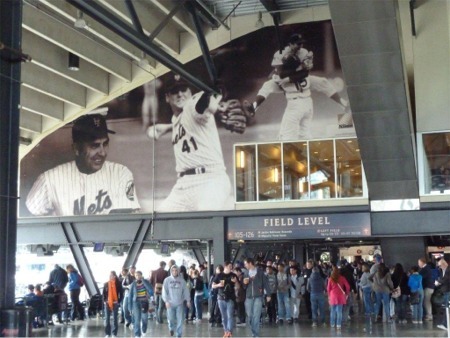 Prior to 2012, the wall was all black except for the orange home run line, but in 2012, the Mets put up a new wall in front of the old one to shorten the distances required for a home run. Most importantly, however, is the fact that the new wall was blue, which means that CitiField finally has some Met colors! Also on the new blue wall is a section in center field with “kid” and number 8 on it to honor Gary Carter, who had passed away earlier in the year. Also in left field on the old high black wall, behind the blue wall, are circular baseball to highlight the Mets 4 retired numbers; # 14 – Gil Hodges, # 37 – Casey Stengel, # 41 – To m Seaver, # 42 – Jackie Robinson, and “Shea” for William Shea, who was the architect behind the Mets inception. 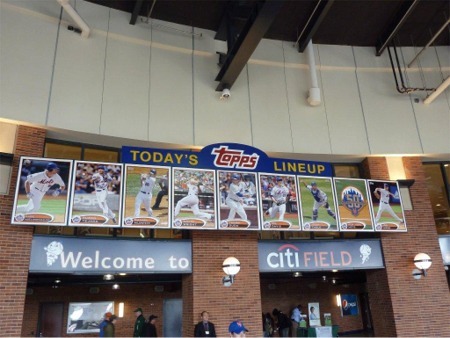 When the stadium opened, the Mets championship banners were nowhere to be found, but they are now located along the façade of the first deck in right field. Once the game started, I immediately got to see Reyes bat, as he is now the Marlins leadoff hitter. 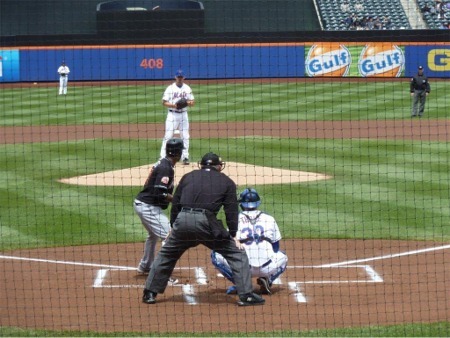 Unfortunately, for him, he flew out to short of Niese for the game’s first out (he would end up 0-4 on the day). He was not the only one though, as Niese retired the first 6 Marlin batters in order. The Mets leadoff hitter, however, fared much better than Reyes did. Kirk Nieuwenhuis tripled off Ricky Nolasco and scored on Ruben Tejada’s sacrifice fly to right field, giving the Mets a 1-0 lead. Although David Wright doubled with 2 outs, the Mets would not be able to do anything else against Nolasco in the first or any inning thereafter. The Marlins did finally get to Niese when Gaby Sanchez led off the 3rd with a home run to tie the game at 1. The Marlins then took the lead in the 5th on a double by Omar infant, which was followed by a Giancarlo (not Mike) Stanton single and a run scoring double play by Sanchez. Both Niese and Nolasco would last 7 innings before giving way to their respective Bullpens. Niese gave up 2 runs on 4 hits and 2 walks with 5 Ks, while Nolasco only gave up 1 run on 5 hits and 1 walk with 4 Ks. Ramon Ramirez came in for the Mets to pitch the 8th and did not allow a run in his 2 innings of work. Randy Choate pitched a scoreless 8th for the Marlins before giving way to the Marlins new high-priced closer, Heath Bell. Bell has openly discussed his dislike for the Mets since they traded him away, so there was some extra pleasure seeing him unravel in the 9th. Bell walked his first batter, David Wright, and then did the same to Lucas Duda and Josh Thole to load the bases for pinch hitter Justin Turner. Turner hung in there and worked out a walk during a 13-pitch at bat that tied the score at 2 by bringing Wright home. Bell managed to get Scott Hairston to ground into a fielder’s choice for the second out, but then Nieuwenhuis singled over the right fielder’s head to win the game in dramatic fashion. I have to say it is always a lot more fun to watch the Mets win, especially since I do not get to see them too often any more. Bottom line – CitiField is still not among my favorite stadiums, but it now at least feels like it is the home of the Mets.